A New Kind of Drug for Alzheimer's? Researchers have discovered a new drug target to fight Alzheimer’s, and the finding could lead to a new diagnostic tool as well. Earlier drugs have long targeted the amyloid protein called plaques, which can cause neurons in the brain to die. But Penn State University researchers have found that another substance, a neurotransmitter known as GABA, could also be implicated in the development of Alzheimer’s. The discovery could present a new target for developing Alzheimer’s drugs, which have been unsuccessful in fighting plaques. Eventually, analyzing the presence of abnormal amounts of GABA might also be used as a diagnostic tool. “We recently discovered an abnormally high concentration of one inhibitory neurotransmitter [GABA] in the brains of deceased Alzheimer’s patients,” said Gong Chen, a professor of biology and the Verne M. Willaman Chair in Life Sciences at Penn State. 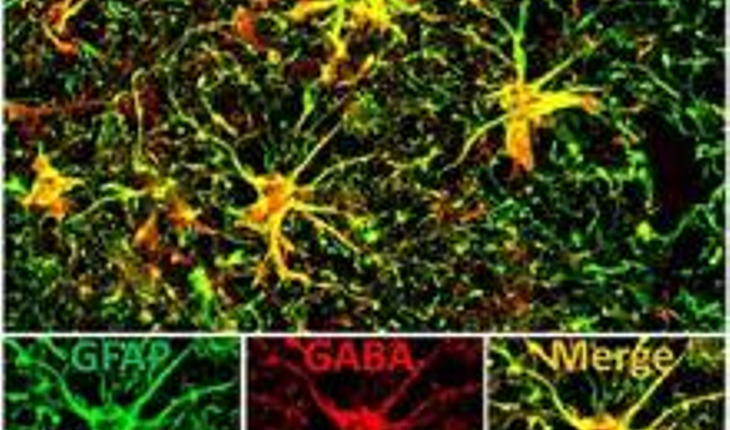 Chen’s team found that GABA was drastically increased in the deformed versions of the large, star-shaped “astrocyte” cells that normally surround and support individual neurons in the brain. To make this discovery, the researchers developed new methods to evaluate neurotransmitter concentrations in the brains of normal and genetically modified mouse models for Alzheimer’s disease. “Our studies of AD mice showed that the high concentration of…GABA… correlates with the animals’ poor performance on tests of learning and memory,” Chen said. He said that the research indicated that the abnormal GABA concentration can’t be solved with drugs that target amyloid proteins alone.